In case you didn't hear, next Wednesday we're inviting you, the readers of Gizmodo, to a reader meetup at Gizmodo Gallery. We'll be giving away Nerf Blasters to the first 40 readers to show up, but if you're amongst the next 60 to arrive-capacity is limited to 100-you're going to be unarmed and out of luck. 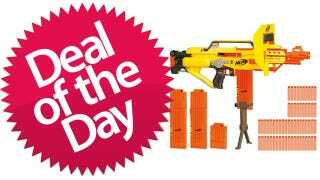 Luckily for you there's a sweeeeeet deal on the Nerf N-Srike Stampede ECS. Stock up on munitions while you can.